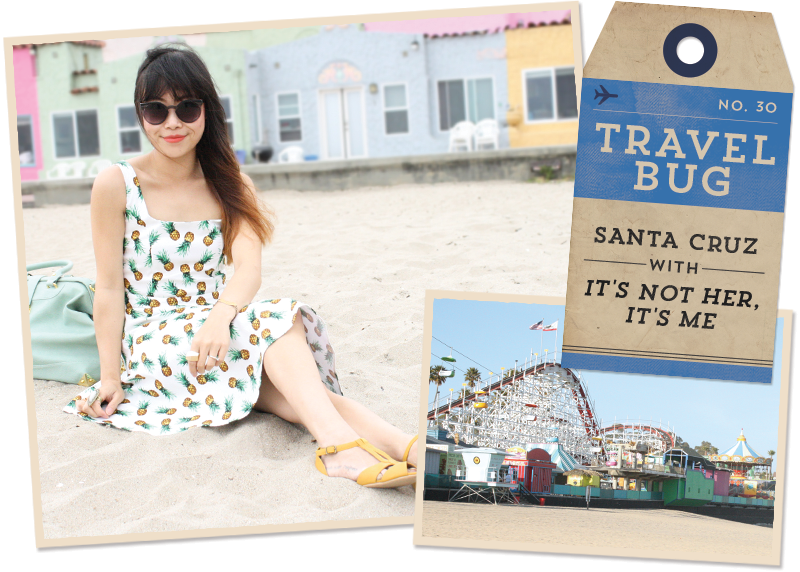 Here are some outtakes from my Travel Bug guest post on ModCloth. 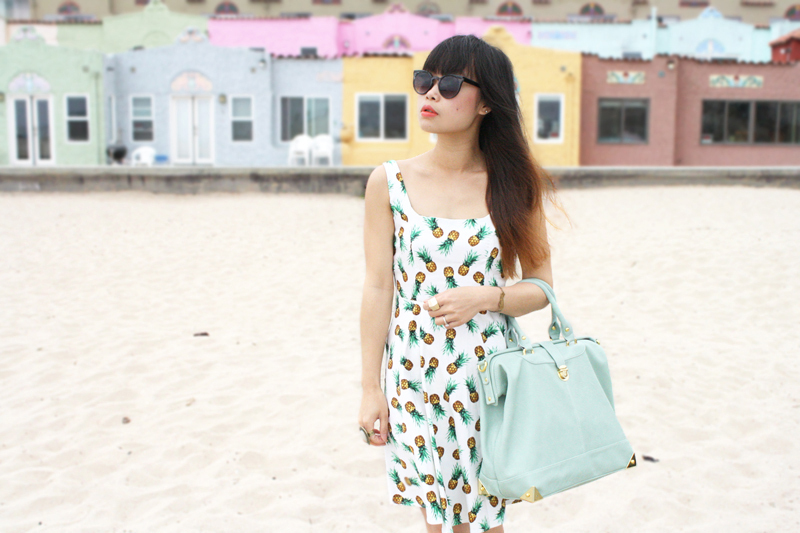 Pineapple print... hmm, what more can I say? 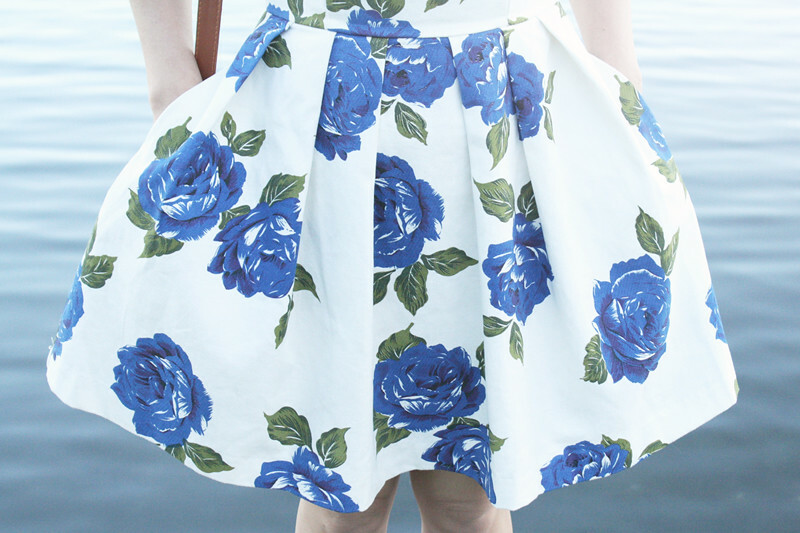 This dress is fresh, playful, and simply perfect for summer. I also love how the super flare silhouette makes it even more youthful, makes me want to spin around! The straps are convertible too! There are buttons on the back so I can criss-cross the straps if I want to! Yet another fun element of this dress! 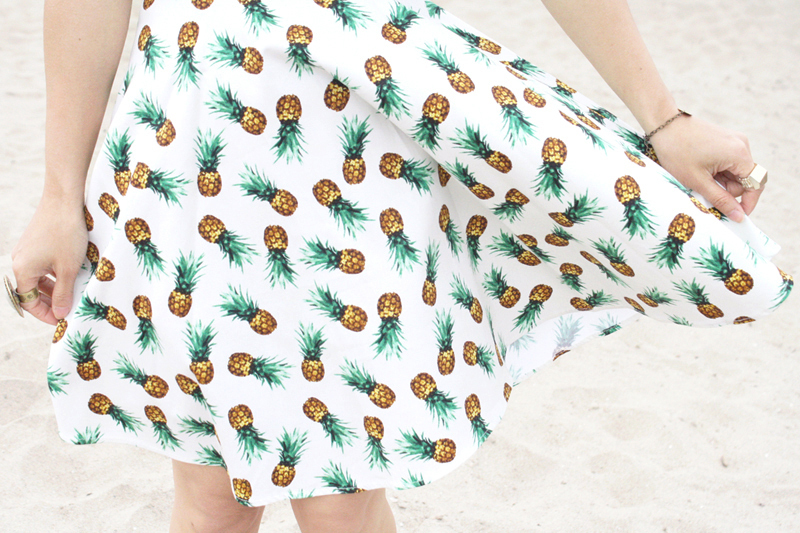 Pineapple print dress c/o ModCloth. Mustard yellow sandals by Chelsea Crew c/o ModCloth. Mint oversize satchel by Nila Anthony. These photos were taken while I was running around town photographing different locations for my Travel Bug guest post on ModCloth (as mentioned in yesterday's post). 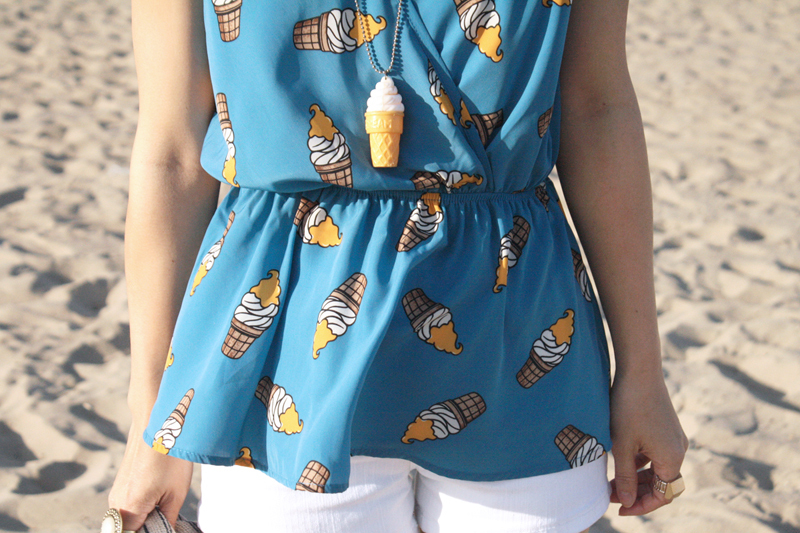 The Boardwalk is a perfect backdrop for this playful ice cream cone print top. The white and mustard make a nice contrast against the blue background and the peplum is just too cute. 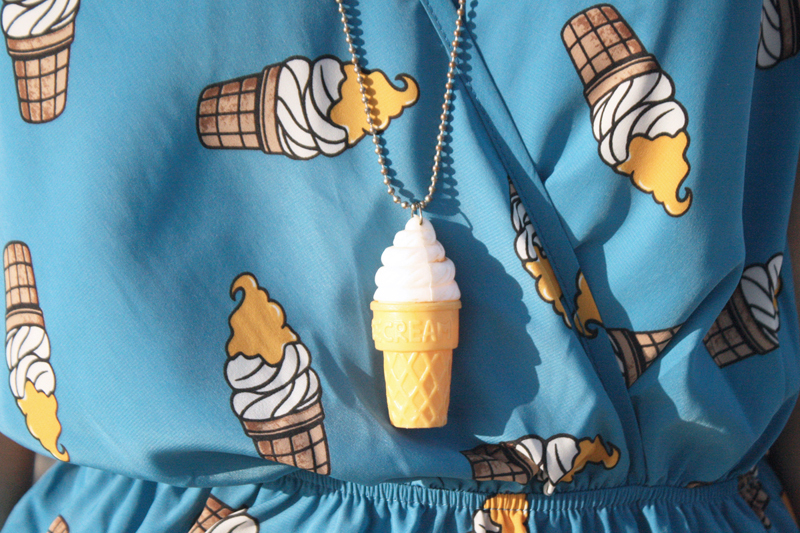 The best part is that I just happen to have a totally matching ice cream cone necklace! I have had it for over a decade, and if I remember correctly the cone was actually my little sister's toy that I made into a necklace! 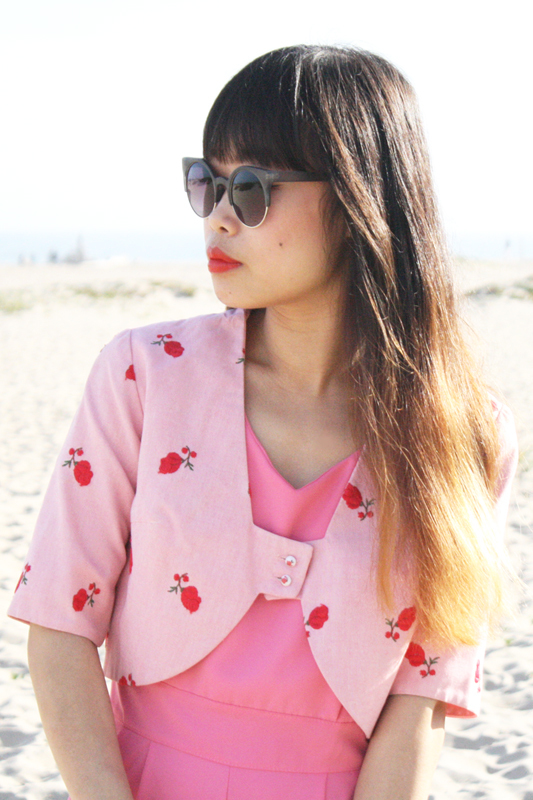 Ice cream cone print peplum top by Peach Love Cream c/o ModCloth. White denim shorts by Just USA. Striped linen blazer by Many Belles Down. Colorblock leather handbag from GoJane. 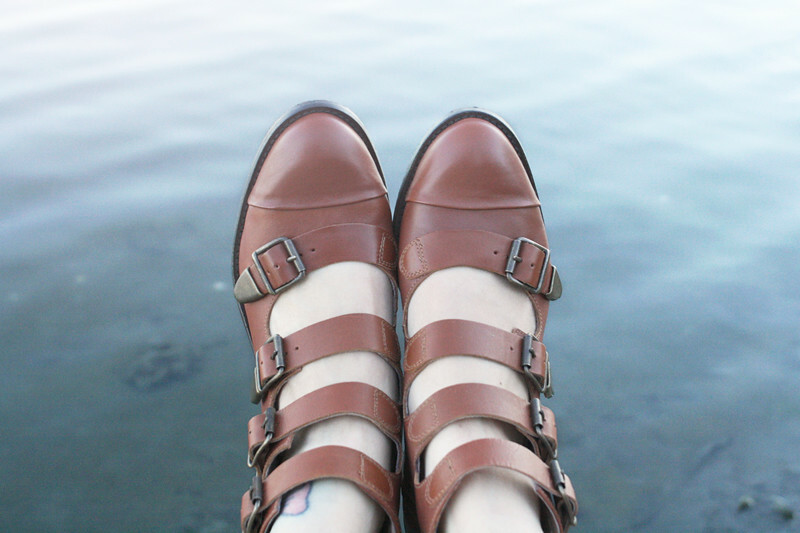 Vintage 70s wooden platformed heels from Etsy. Hope everyone is enjoying this Memorial Day weekend! Did you wear red, white, and blue? I sure did! 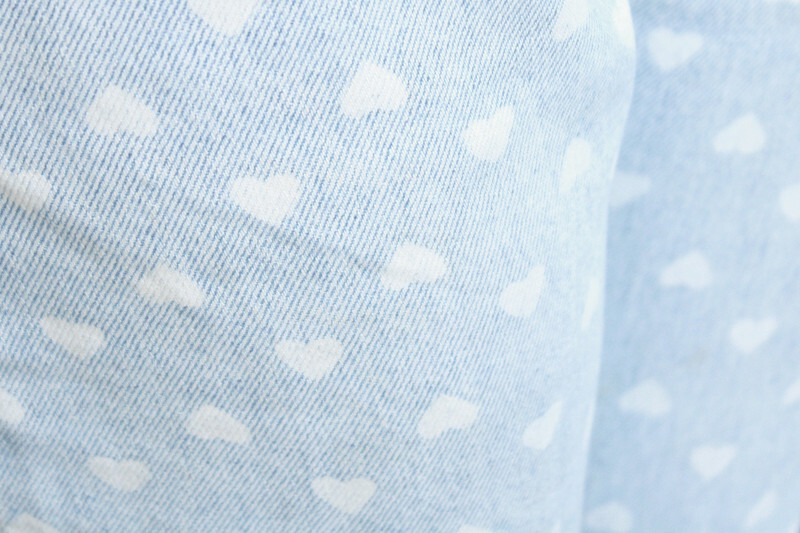 This chambray polka dot romper from my sponsor Lulu*s is so lovely. I adore the feminine sweetheart neckline and the playful open back that ties into a bow. The material is comfy and I love that it has pockets too. 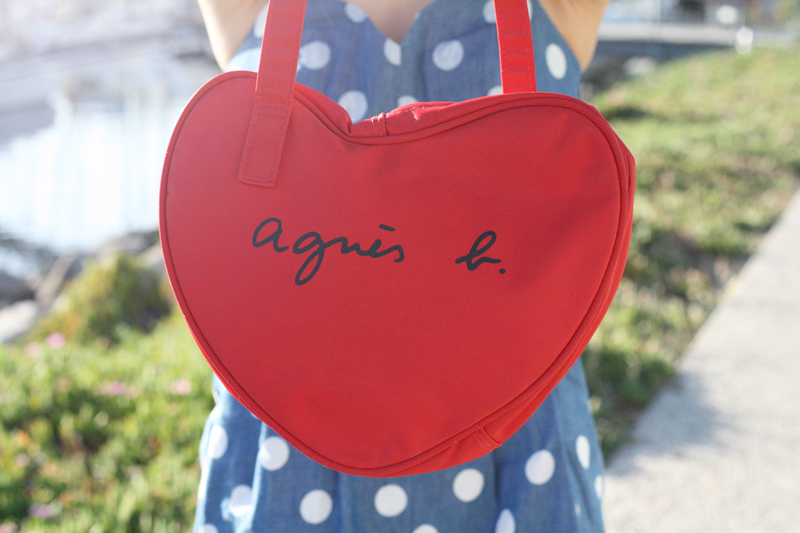 I added a pop of red with matching heart shaped glasses and Agnès B. purse. 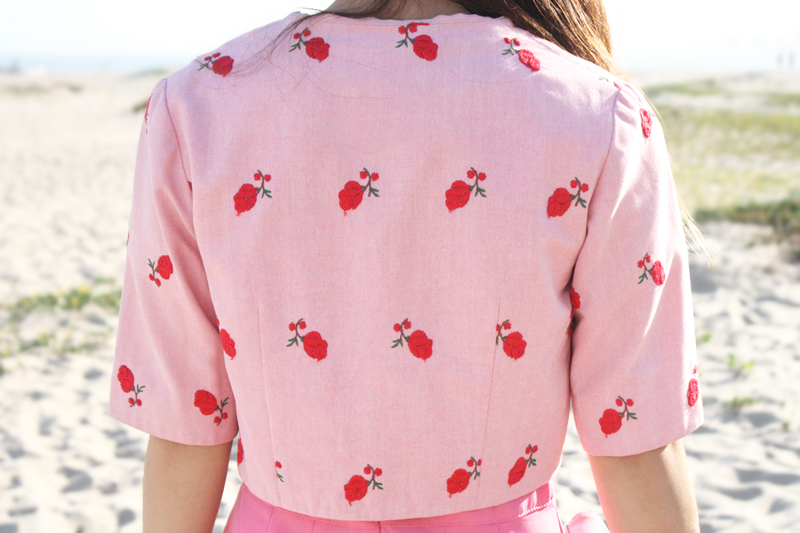 Oh, and I thought taking photos of this outfit at the harbor with all the sailboats was kind of perfect. Don't you think? 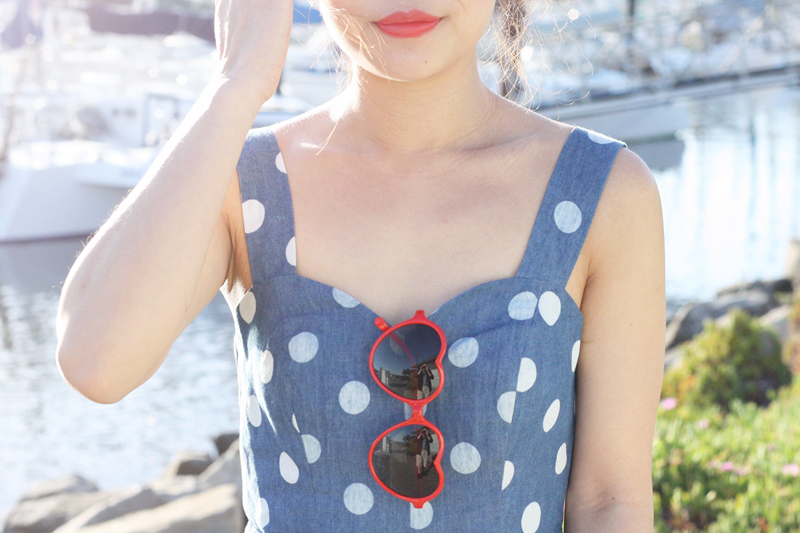 Chambray polka dot romper by Monteau c/o Lulu*s.
Heart shaped sunglasses c/o Calico. Heart shaped purse by Agnès B..
Thrifted vintage leather mesh flats by Karen Scott. Who doesn't love a good daisy print? 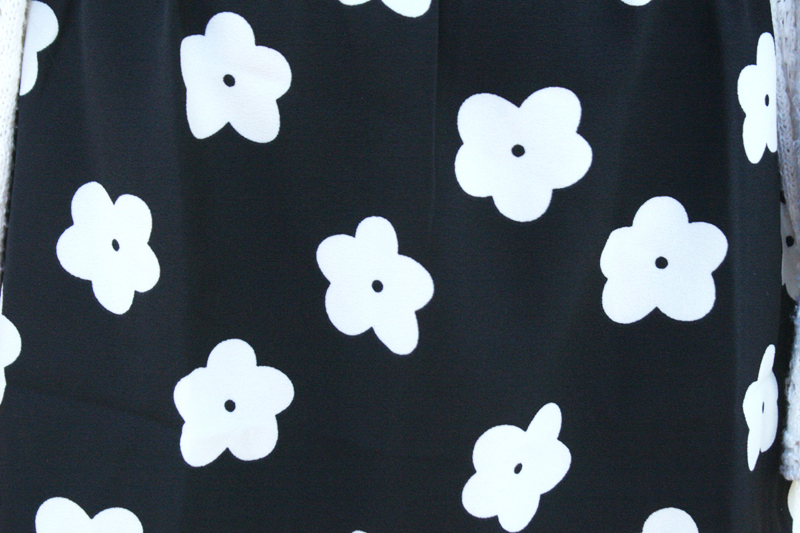 You can never go wrong with this classic black and white pattern. From 60s mod to modern day Marc Jacobs and Prada, daisy doesn't seem to be going anywhere anytime soon and I am totally okay with that! 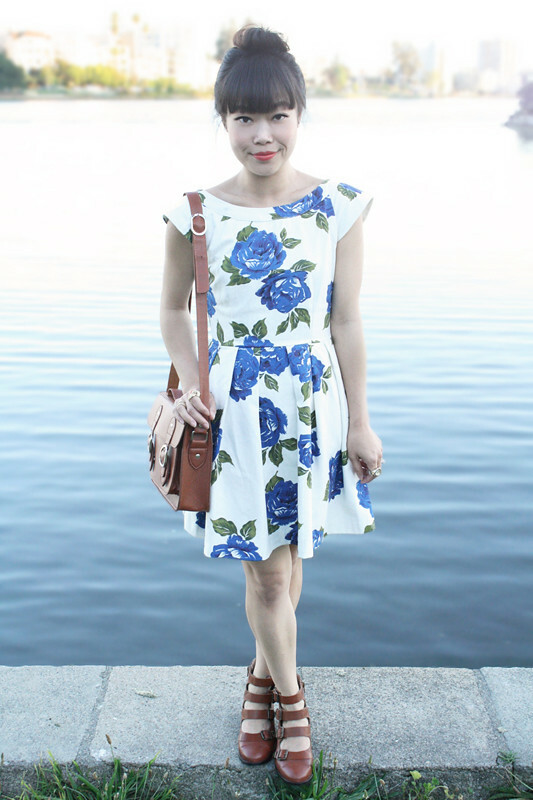 This daisy print dress with side cut outs from Choies is easy and goes with anything, like my awesome Deandri Helga in red snake. I tied the two together with a burgundy floppy hat and black handbag and gave the look more layers with a light crochet sweater. Hope you all have a wonderful weekend ahead! 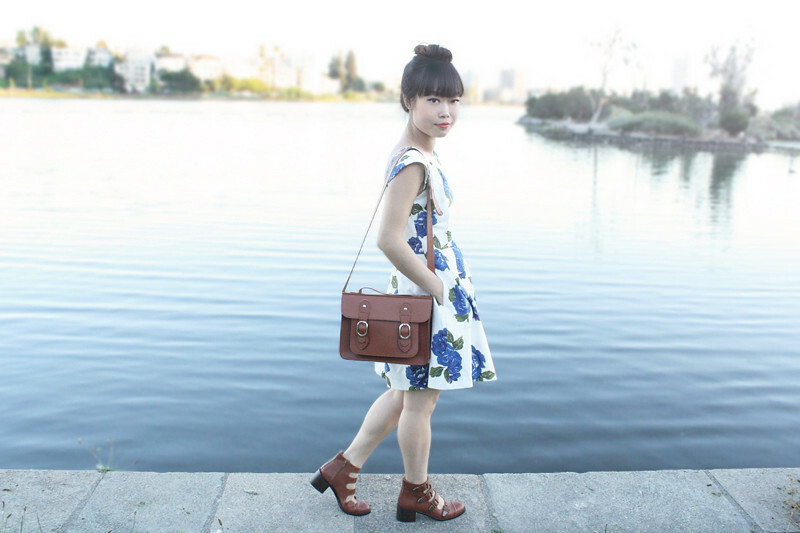 Daisy print dress c/o Choies. Helga in red snake by Deandri from Karmaloop. Burgundy floppy hat from F21. Two way croc print bag c/o OASAP. Wearing one of my all time favorites... the I Love You silk blouse by Vivetta. This piece is very special to me because it was a personal gift from Vivi herself! The cream color makes it versatile and easy to go with anything, this time I paired it with vintage high waisted heart print jeans from Little Iowa Vintage. 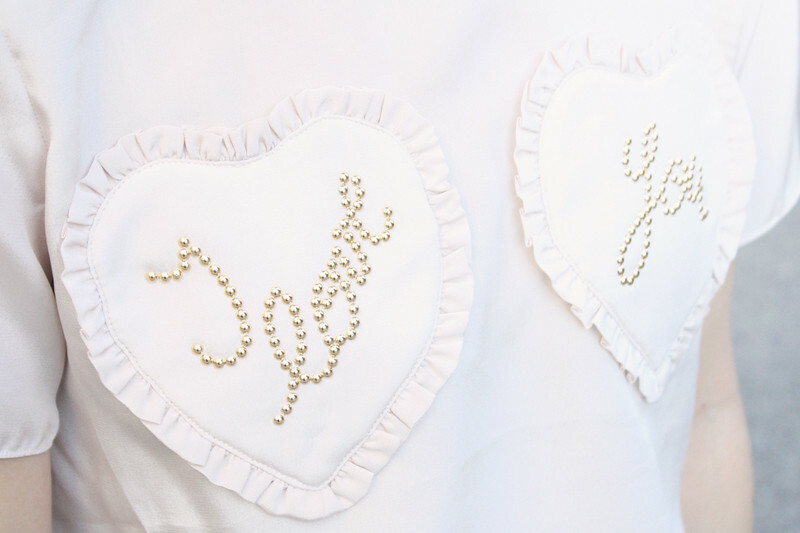 Both of these pieces are rather subtle so the hearts on hearts action isn't too cheesy. I pulled the whole look together with ZeroUV sunglasses, gold loafers, Melie Bianco Bailey bag that I can't stop carrying, California bracelet, and a handmade crystal quartz cuff by Natalie Vivar. 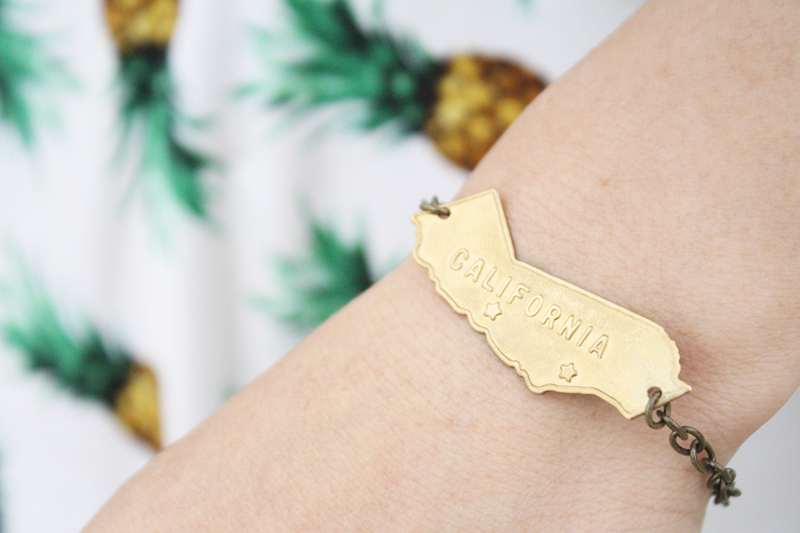 I will be doing a jewelry post soon so you will see details of this lovely piece then! I Love You silk blouse c/o Vivetta. Vintage high waisted heart print jeans c/o Little Iowa Vintage. Bailey handbag c/o Melie Bianco. 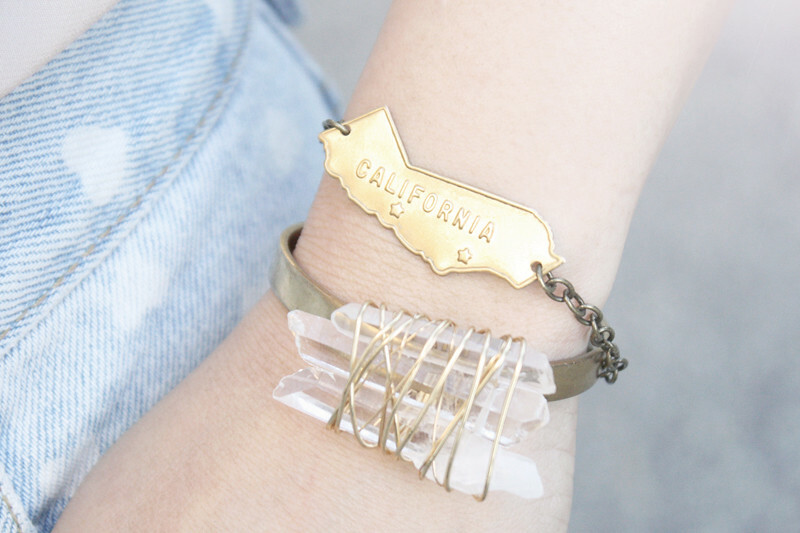 Crystal quartz cuff c/o Natalie Vivar. Gold loafers from Wet Seal. Roses aren't red, they are blue! At least the ones on this lovely dress are! I have fallen head over heels for this Mink Pink dress my sponsor Lulu*s sent me. It is the perfect summer dress with its vintage inspired cut and low scoop back. When I was changing into this outfit, there were a million pair of shoes I wanted to wear with it... white flats, red wedges, mustard sandals, etc. I finally settled with my TopShop strappy leather booties because I thought the brown and blue make a nice contrast. Oh did I mention the dress has pockets too? Now, that's a bonus! 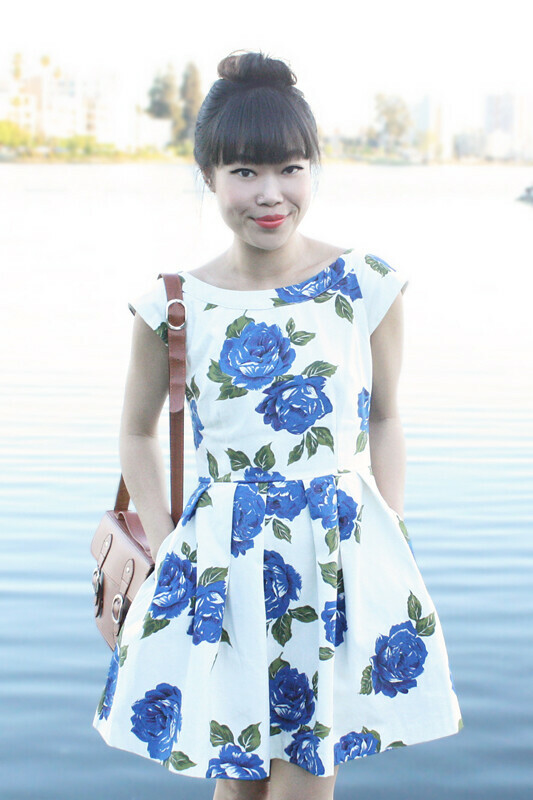 Blue roses floral dress by Mink Pink c/o Lulu*s.
Anna buckle strap boots from TopShop.